Last weekend, news broke that Bolivian president Evo Morales had redistributed some 94,000 acres of land in the hostile (and wealthy) eastern lowlands region. 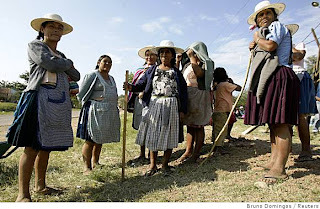 In a Reuters article, "Bolivia Passes Land From Rich to Poor," Morales explained, "Private property will always be respected but we want people who are not interested in equality to change their thinking and focus more on country than currency," referring to the use of slavery by the wealthy landholders in the region. Opinions of this historic step in Bolivia's decolonization are, of course, varied. Ben Dangl's article, "Justice in Bolivia" on ZNet nicely contextualizes the redistribution of land in Bolivian political history and media coverage. Dangl goes into the corruption scandal that hit the Movement toward Socialism (MAS) party (Morales's party), the polarizing occupation of former-vice president Victor Hugo Cardenas's house, and finally, the pattern of misinformation plaguing media coverage of Bolivian events. Read Dangl's article here.